AutoMap route planning software will show you every job location colour coded by Job Type or Rep. For any company that operates vehicles on the road for field services, pick-up, delivery, collections, or any transport related activity. Using the data stored in your CRM database, AutoMap will instantly show you every job location with a marker coloured either by job type or dynamically coloured by rep.
Route planning and optimisation can be achieved in seconds by simply toggling the 'Optimise' button. Set you reps 'Home' or the Depot as journey start, end or both. 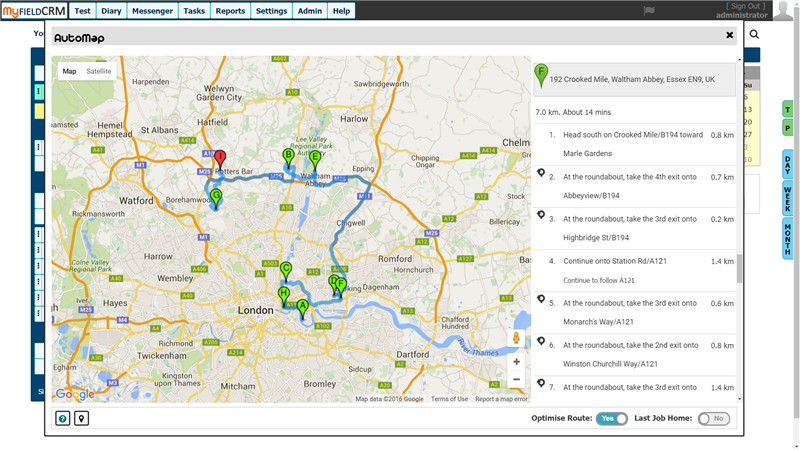 This allows every destination point to be optimised to find the most effective route. By using your mobile device to look up each destination, a route can be planned from your current location to the planned route destination with step by step audio and visual instructions. Every location of your journey can be optimised as a satellite navigation route without ever typing in a single character of the address. AutoMap uses the data already stored in My Field CRM. 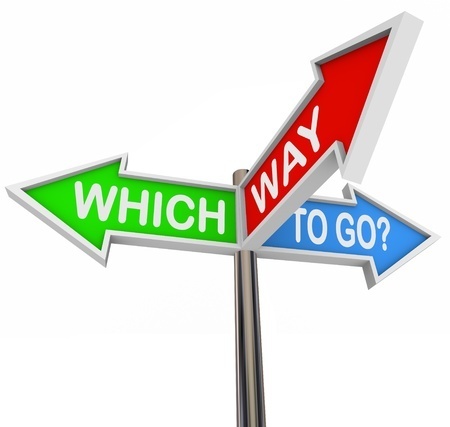 Route planning forms an essential part of any transport business from delivery and collection routes to field service companies with planned maintenance calls. Keep your fuel costs down and your profits up. 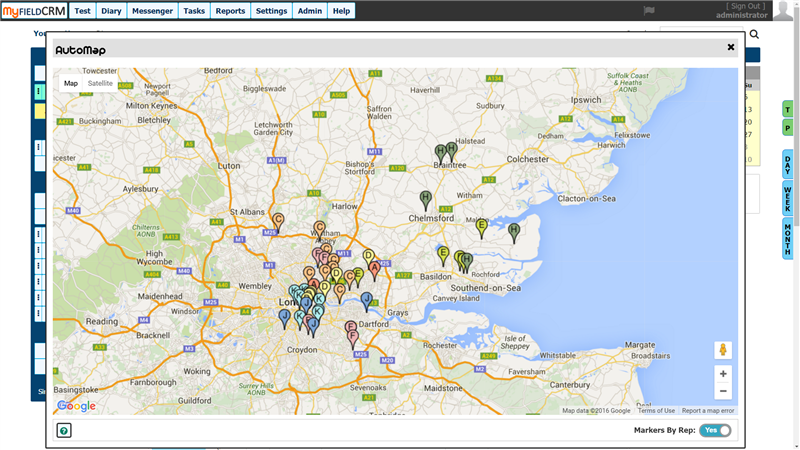 Our map data and location information is collected right at the moment you enter the customer record. This means a super fast response when creating the map. View up to 500 locations at once in a matter of seconds, each marker is directly linked to your customer data giving you instant information and details at the click of a mouse. Route Optimisation gives you a before and after view of each location allowing you to update your appointment diary and routing schedule instantly. Using your mobile device, you can view both your appointment diary and navigational information just as you would at your desktop computer. With a planned route optimised to cut fuel costs and increase profitablity you can deliver an unrivalled service to your customers. Create a route directly from the data within My Field CRM. Never type another post code or customer address on your mobile device. 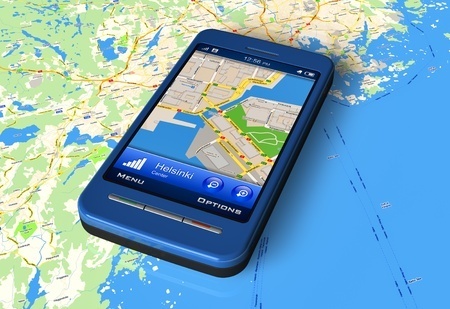 Use the information already stored to navigate you directly to your destination. 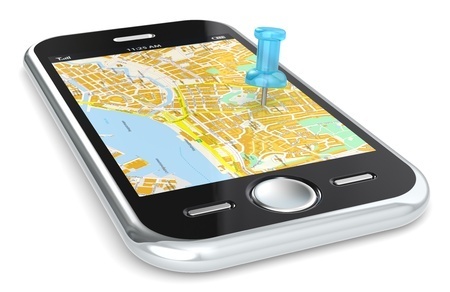 With your mobile device, you have instant access to every customer location held within your My Field CRM. Each address has been pre-optimised with routing information through AutoMap. Giving you a super fast response to our direction services. 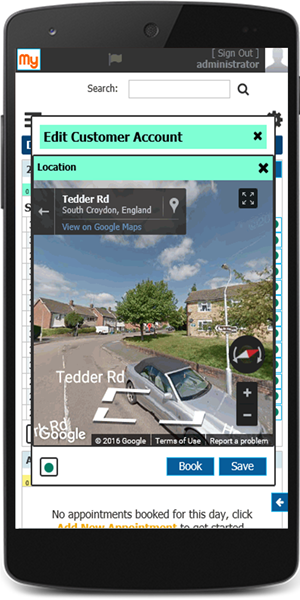 Linked directly to Google maps with address data pre inserted, you will never need to type in an address again while on the move. Optimised routes and local traffic information allows for instant re-routing should a problem arise on the way to your destination. With all the work planning your route already done, your one click away to navigating from your current location to your pre defined destination.